Longtime members of The Pyrates Royale, Kat Fairbanks and Long John Skivvy (pictured at right) are ready, willing, and able to fulfill your maritime music needs! (Doesn't everyone have those?) Send inquiries to bookings@pyrates.com. Often imitated but never duplicated, The Pyrates Royale made its mark by combining seafaring history, music, comedy and reenacting. 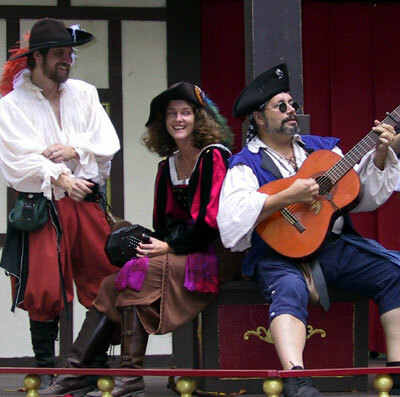 Singing and Comedy -- Since the group's debut at the Maryland Renaissance Festival in 1987, The Pyrates Royale set the standard for comic "singing pirate" acts at renaissance festivals throughout the United States. They also boarded ships, acted in plays, played prettily at weddings and sang raucously at parties. Expect a rich blend of traditional and current folk music and a surprising variety of instruments, including guitar, concertina, hammered dulcimer, bouzouki, violin, and percussion in addition to smooth vocal harmonizing. Interactive Performance -- We don't just tear down that "fourth wall," we blast it into powder! We mix, we mingle, we harass our audience one-on-one in character... until they start to wonder if we're going to take a few hostages or press them into service! Real Salts -- We have friendly alliances with tallships up and down the east coast. One of our performers, Darcy Nair, is a volunteer sailor on the crew of the Kalmar Nyckel, a tallship docked in Wilmington, DE. She climbs the rigging, ties knots, hauls lines and scrubs the deck. She still eats with a knife and fork, though. Beyond the Sea -- We are available in costume or in "civvies" -- no event is too unconventional and no client is too creative! We even switched genres and ventured into Irish territory and country-western mode for some productions. The National Aquarium -- Baltimore, Md. Walter's Art Gallery -- Baltimore, Md. Folklore Society of Greater Washington -- Washington, D.C.
Pirates in Paradise Festival -- Key West, Fla.
Norfolk's Harborfest -- Norfolk, Va.
OpSail 2000 -- Norfolk, Va.
Lee Island Pirate Festival -- Fla.
Havre de Grace Maritime Festival -- Havre de Grace, Md. Annapolis Maritime Festival -- Annapolis, Md. Jefferson Patterson Park and Museum -- St. Leonard, Md. Mercer Museum Festival -- Doylestown, Pa. The Pyrates Royale Pub Sing -- Historic Dumfries, Va.
A Pyrate Home Companion -- Manassas, Va.
1998 World Science Fiction Convention -- Baltimore, Md. Read these testimonials, then contact us. We'll be happy to discuss your evil plans and our very reasonable rates. Best Recording -- "Tales of the Brigantine"